While choosing works to correspond to the countries of birth of the performers might be a rather artificial construct, it works here because of the quality of the three trios. They're all twentieth century, but all tonally based and deserving greater recognition on the concert stage. I have attended quite a number of concerts featuring piano trios but have not heard any of these. The Clarke Trio is a darkly intense work, full of strong emotions. In my Piano Trio survey, I suggested that the Hartley Trio recording (Heritage - review) was the pick of the options, but the Lincolns pip them here. They give a raw-boned passionate performance that makes the Hartleys sound a little too polite. The Lincolns are a minute slower in the outer movements than the Hartleys, and while that can be a problem, here it isn’t. The Babajanian Trio was one of my early “discoveries” in the trio survey. I would rate it as one of the finest written in the twentieth century, and to be fair, it has received reasonable coverage in the recording studio; this new one makes at least a dozen. It is a work not of its time, but in the same way that those of Rachmaninov and Khachaturian, to pick two reasonable comparison points, were also out of step with “modern” developments. All three movements are splendid, but the Andante second is absolutely glorious. Again the Lincoln Trio give an exemplary performance, catching to perfection the melancholy beauty in the first two movements and the Armenian dance rhythms in the finale. Frank Martin is a composer whose virtues have yet to present themselves to me fully, but this fairly early trio, based on Irish folk melodies, may be my entrée to his world. Martin never travelled to Ireland as far as I can tell, so the inspiration for this work seemed surprising. Apparently, it was commissioned by an American musician who was probably hoping for something very populist. Instead, Martin, who was living in Paris at the time, sought out authentic, and little known, Irish melodies, leading to the commission being withdrawn. Undaunted, he completed the work, and it is a thoroughly enjoyable work, unquestionably Irish, underlined by the Gigue finale. Martin’s quest to ensure the authenticity of his sources, and his twentieth century musical language have produced a fine work in its own right. Being someway short of “M” in my survey, I hadn’t heard any other recordings, but listening to a few samples leads me to believe there are unlikely to be any better than this. 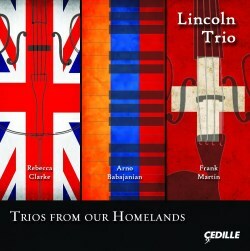 The Çedille engineers have captured the Lincoln Trio in very natural sound, clear and precise but not too close, so there are no performer-derived sniffs or piano mechanism clunks. The booklet notes are informative. So we have three cracking works in performances that are as good as any, with high production values. What you are waiting for?